Monday, October 29, 2018 – Insilico Medicine, a Rockville-based company developing the end-to-end drug discovery pipeline utilizing the next generation artificial intelligence, will present its latest advances in human aging biomarker development at the Investing in the Age of Longevity Conference in London, 1 of November. New technologies in Artificial Intelligence (AI) are paving the way for advanced biotechnology research of aging. The presentation will focus on recent developments in biomarkers, using deep learning, blood biochemistry, gene expression, as well as imaging data. It will also cover the application of deep neural networks in drug discovery, including the generation of new models that could target the aging process. "We are happy to present some of our latest research at the Investing in the Age of Longevity Conference, which gathers the leading longevity scientists and investors. 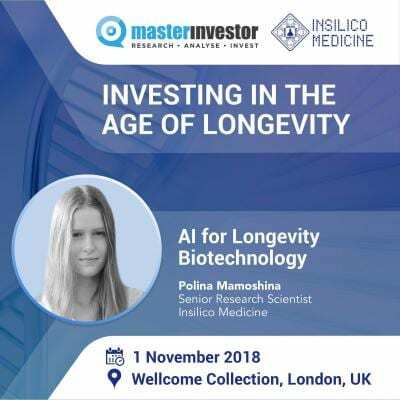 Longevity has fascinated mankind for centuries, and now with the increased scientific understanding of aging we are looking into the longevity industry as one of the greatest investment opportunities of all time," says Polina Mamoshina, a senior research scientist at Insilico Medicine. Investing in the Age of Longevity brings together all the scientists and business leaders to discuss obstacles and objectives, share and learn the first-hand experience from the experts, as well as help investment companies utilize the scientific expertise in building a solid longevity investment portfolio. The Conference is held on the 1st of November. For the audience, interested in learning more about the opportunities and challenges of the industry, professor Alex Zhavoronkov, CEO and Founder of Insilico Medicine, will be participating in the panel discussion of the Conference jointly with other experts of the field.